Magical silence all around you. The overwhelming beauty of the desert, chancing colours all the time. It’s like a dream, a dream of peace and harmony which comes true. Taste the grandeur of the desert and surrender to it completely. And doing that feel your connection with all and everything. 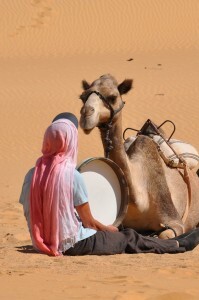 Our safaris are a personal meeting with the magic of the desert. Enjoy for days, high seated on the hump of your own camel or walking along it, the landscape that time after time will surprise you: sandy and rocky places, mountain peaks and limestone sculptures modelled by the wind, palm trees and springs, enormous sand dunes as far as the eye can see. Watch the colourful play of the sun rays from sunrise to sunset. The peace of the desert, just looking to the flames of the camp fire. Feel the overwhelming beauty of millions of stars above you, who guide you through the night and sent your wish out by every shooting star you see. The desert energies are subtle, but at the same time tremendously powerful and of an intense purity. This makes it easier to connect with your innermost and soul. You will feel strong connected with everything existing. The camel trek allows for a deeper and more adventurous delve into the Western Desert, including the White Desert and the Great Sand Sea. It explores the lesser visited and untenanted areas. We will walk with the camels for about five hours a day, which we alternate with making tea, picnics, collecting desert treasures or whatever we want to do. Programs are flexible. We are at your service.